Abstract submission and registration deadline extended to 30.6.! 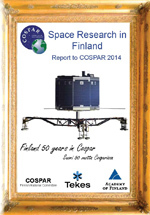 The meeting is organized by the Sodankylä Geophysical Observatory (SGO) and the Arctic Research Centre of the Finnish Meteorological Institute (FMI-ARC), together with the Finnish National COSPAR committee. The hotel Luostotunturi serves as the conference venue. The meeting brings together space researchers from all the Finnish institutes engaged in space research, astronomy and remote sensing as well as our colleagues from foreign universities. The meeting has been concluded, thank you for attending! The FinCOSPAR 2015 programme includes invited talks on the Rosetta mission and contributed presentations from varied topics. Additionally, there will be a review of the Finnish space research activities, with a subsequent panel discussion on the subject of profiling and distribution of space research topics between the Finnish space research centers. Other topics covered include but are not limited to: the physics of the Earth magnetosphere and ionosphere, solar physics, influence of the Sun on the Earth and its climate, solar system planets and planetary rings, stars and star formation, asteroids and stardust, the Galaxy, other galaxies and supermassive black holes in their centres, structure formation in the Universe, physics of plasmas in astrophysical and geophysical contexts, space instruments and Earth observation from the space. The registration fee is 100€, which covers the conference dinner and lunch on Thursday and coffee breaks throughout the meeting. Registration is now open, register by using the registration form by 30.6.2015. Both oral and poster presentations are welcomed, please upload your abstract at the registration page by the 30.6.2015 deadline. The working language of the conference is English. The hotel Luostotunturi is reserved for our meeting, and the on-line booking systems will show that the hotel is full. You can book your room via e-mail or by phone directly with the hotel - remember to mention that you're coming to FinCOSPAR. on behalf of the Finnish National Committee Tuija Pulkkinen and Markku Alho, Aalto University.